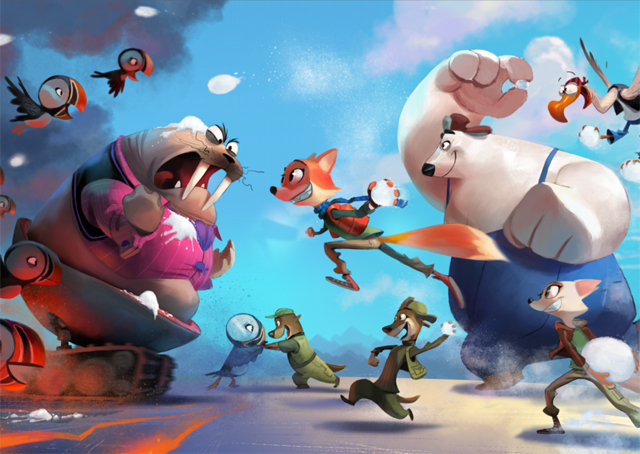 Open Road Films has acquired all U.S. rights to Arctic Justice: Thunder Squad – the epic 3D CGI animated family film from Andrea Iervolino and Monika Bacardi’s AMBI Media Group. The movie features the voices of Jeremy Renner, Alec Baldwin, Heidi Klum, John Cleese, James Franco, Anjelica Huston and Omar Sy, and is directed by Aaron Woodley. The announcement was made today by Tom Ortenberg, CEO of Open Road Films. Check out more production art in the gallery below! Swifty (Jeremy Renner), an arctic fox, dreams of becoming one the famous Top Dogs, a team of huskies that deliver packages for the Arctic Blast Delivery Service. In the Arctic, every day trips can quickly turn into epic journeys, which make the Top Dogs the Arctic’s every day heroes. In an effort to prove himself, Swifty secretly commandeers a delivery sled to takes a mysterious package to a secret, icy, fortress where he comes face to face with Doc Walrus (John Cleese), a blubbery evil genius who walks around on robotic legs, and commands a loyal army of oddly polite puffins. Swifty stumbles upon Doc Walrus’ evil plan to drill to the center of the Earth to unleash enough lava to melt the polar ice caps in order to flood the planet and become be king of the world. Now, Swifty has to enlist the help of his friends: PB (Alec Baldwin), an introverted polar bear, Lemmy (James Franco), a scatter-brained rock and roll albatross, Sal (Omar Sy) and Weez (Heidi Klum), two conspiracy theorist otters, and Jade, a red fox, who’s a tough as nails mechanic that Swifty has a secret crush on. 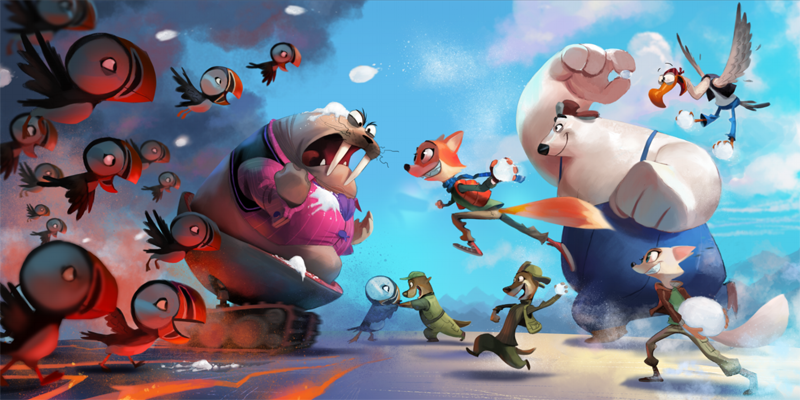 This ragtag team has to band together and overcome their differences if they’re going to stop Doc Walrus and his army of Puffins from destroying the world. Open Road will release Arctic Justice: Thunder Squad wide in 2018. Animation work for the film is currently being done out of AMBI’s Toronto based studio, AIC Studios. The movie is fully financed and being produced by AMBI and its principals, Andrea Iervolino and Monika Bacardi. The deal was negotiated on behalf of Open Road Films by CEO Tom Ortenberg, Chief Operating Officer and General Counsel, Elliott Kleinberg and SVP Acquisitions, Lejo Pet and by Andrea Iervolino on behalf of AMBI Media Group.